Whenever I take on the open waters to embark on one of my many fishing trips, there are a few key things that I make sure I have with me. One of those is a special fishing pole that my father passed down to me and another is my reliable Pelican ice chest. Finding a cooler that can endure unpredictable weather patterns, as well as be large enough to fit everything I need to live comfortably on my fishing boat for a few days was a difficult task at first. I couldn’t find a cooler that had ice retention that would last longer than a day, and also be sturdy enough to be transported back and forth a lot. That was until I discovered the Pelican brand a few years ago, and after doing some research I found out that this brand has been around since 1976 and was created by an avid Scuba Diver who needed a marine cooler that was sturdy, durable, reliable, and made for the outdoors. After that I became the owner of my first Pelican ice chest and I haven’t looked back since. The first Pelican ice chest I purchased was the Pelican 45 QT, which I used to preserve my catches for the day, as well as a few refreshments to hold me over during the trip. The Pelican 45 QT cooler, more specifically their Elite model, is a fisherman’s dream cooler. The tough roto-molded construction is built so sturdy that even bears can’t break it open! The Interagency Grizzly Bear Committee bestowed upon Pelican Coolers a certification that verifies this, so you won’t have to worry about any Grizzly Bears breaking into your cooler and taking a good catch or any of your refreshments. At 35.95 pounds the Pelican Elite Cooler may seem a bit heavy, but the dual handle system featuring molded in and hinged handles makes this cooler very easy to carry. Corrosion resistant stainless steel hardware makes the Pelican a beast against all sorts of different weather, from snowstorms to intense rain storms. Even during some of the most violent storms, my Pelican ice chest has come out of it unscathed. Although the sturdiness and portability of a cooler are important components to making the decision on whether or not a cooler is worth buying, probably the most important characteristic of a cooler is how well it can cool things off, or the ice retention capabilities. For a fisherman, ice retention is most important, especially if you are using your cooler to ensure your catches stay fresh. After all, a spoiled catch is a big hit to your pocketbook or stomach. The ice retention is where Pelican ice chests really impressed me and reeled me in as a lifelong customer. Encapsulated by two-inch polyurethane plastic, Pelican boasts an ice retention of up to ten days! I didn’t believe it myself until I cracked open my Pelican 45 QT after it being in the sun for a few days and found that most of the ice was still intact. It was this amazing ice retention along with the reviews I had read on https://discountcoolersales.com/ that prompted me to go ahead and also purchase a Pelican 65 QT cooler to bring along with me on some of my longer trips, where I need more space to keep some of my bigger catches. Bottom line is Pelican ice chest has perfected the formula in making a cooler that is made especially for a fisherman or someone else in the marine field. My 45 QT and 65 QT coolers are the best sidekicks I could ever ask for on a fishing trip and I will most likely be adding another Pelican ice chest to my collection very soon. Navigation lights offer illumination for water vessels that include ships and boats. OPT7 boat bow lights show the latest position of the water vessel at a particular point and its direction. Navigation lights are very important for fishing boats to avert collisions and accidents in the water during night adventures. 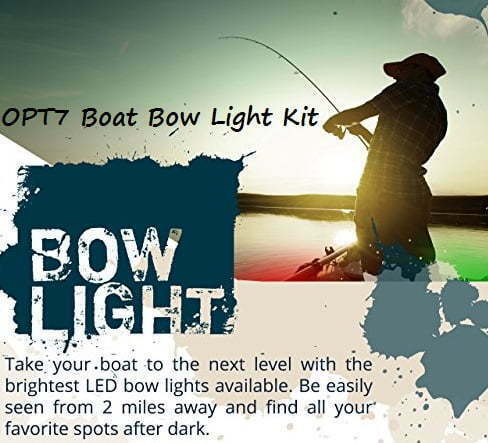 An OPT7 boat bow light kit is an essential for any serious charter fishing boat. They are very similar to the OPT7 HID headlights you might install on your car. In case of limited visibility, marine navigation lights should be used on boats. This is especially important while navigating in the water after the sunset, when there is not much light outside. Navigation lights were first used in ships and other water vessels in 19th century. According to the standard international navigation rules, recreational boats and ships operating after sunset are required to use navigation lights, such as OPT7 boat bow lights. Every fishing vessel is equipped with navigation lights that give other boats an idea what’s coming its way. It helps captains to determine which way to proceed. The standard navigation lighting for boats is a green light which shines 22.5% on the stern towards the beam and mounted on the side of the vessel. A red light should also be fitted in a similar manner on the other side. Most of the fishing boats also come with a white light that lightens both the sides. OPT7, is one of the most trusted brands in marine lighting, which provides navigation lights for all types of water vessels. Whether you are planning to install navigation lights on a small boat or upgrading the LED light bar on a large fishing vessel, OPT7 Navigation Light Kit has all the right tools available at a very reasonable price, so that you can perform the job quickly and get back to fishing! OPT7 has grown into successful businesses by producing some of the most affordable light bars that are available in the market, which offer 3 times more light than its competitors. OPT7 LED bow lights are equipped with powerful SmartColor LEDs and a heavy-duty design that comes with an impressive IP68 security rating. Irrespective of this, OPT7 LED lights are inexpensive compared to most of the other lights in its category. This combination of quality and affordability has made them very popular among fishermen today. Thanks to the great combination of brightness, affordability and durability offered by the OPT7 boat bow light kit, the company has recently become one of the best sellers of marine navigation lighting in the market today. These 5 mm SmartColor™ LEDs are bigger than the other top LEDs and produce three times brighter illumination. These lights can be fitted to any boat and just takes half hour to complete the installation process. There are many cheap navigation light kits available on the market. But OPT7 boat bow lights are not like them and come with a long shelf life. In fact, these lights are just as good as the most expensive lights you see. SmartColor LEDs also ensure that you can be seen from a long distance. These High-efficiency navigation lights deliver vibrant lighting without overheating and can lasts up to 50,000 hours. There is no denying the fact that OPT7 boat bow lights offer a great value for your money. Sailors and anglers rave about these navigation LEDs for their brightness and quality, proving that you can buy an exceptional LED bow light on a budget if you know where to get it. We’ve installed the OPT7 boat bow light kit on our charter boat and we love it! It has performed superbly, thus we highly recommend it.